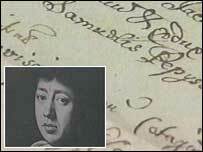 The fate of famous diarist Samuel Pepys's young mistress has been unearthed by new research. A lecturer at Leicester University has revealed Pepys and his mistress Deb Willet kept in contact after she was banished from his household. His affair with the 17-year-old servant was recorded in one of the best-known episodes of his 17th Century journal. Oxford University's main research library revealed that she later asked her former lover for help. University of Leicester lecturer Kate Loveman said Deb's new husband asked Pepys, a naval officer, for help in finding a job and he found the man some work on a ship. "Given Pepys's past obsession with Deb, his continued contact with her family raises suspicions about the nature of their relationship," Mrs Loveman said. "He may have assisted Deb and her husband out of simple benevolence. "However Pepys's wife was now dead, Deb was living close by, and Pepys knew she was without her husband - indeed he had helped send her husband elsewhere. "The situation is particularly suspicious because Pepys's diary reveals that his affairs with women had more than once led to him helping their husbands to a position on board ship," she said. Deb Willet died in 1678 when still a young woman. The lecturer says her research, which involved trawling through the archives of Bodleian library, Oxford, sheds new light on the writer. "Pepys describes in vivid terms his infatuation with 17-year-old Deb, his wife Elizabeth's discovery of the affair, and the strife which followed, including an episode when the jealous Elizabeth threatened him with hot tongs. "After tracking Deb obsessively around London, Pepys eventually lost contact with her and, in his last diary entry in May 1669, regrets that 'my amours to Deb are past'." Mrs Loveman's findings are published in the latest edition of The Historical Journal.